Seafood Safety: Get Educated, Eat Up! In New York's Great Lakes region alone, more than 1,400 boaters pledged to be environmentally-sound after visiting the 2010 Discover Clean and Safe Boating exhibit at events throughout the freshwater shoreline region. The 2011 edition of the campaign includes a fishing boat, a canoe, and national Stop Aquatic Hitchhikers information on how boaters can reduce the spread of unwanted invasive species. In 2012, aquatic invasives remained a hot topic, along with life-saving in-water demonstrations. The exhibit has now been seen by more than half-a-million boaters and potential boaters and counting at over 50 events through 2014 in all of New York state's coastal regions, including this year's Empire Farm Days and even the New York State Fair. Controlling the spread of aquatic nuisance species - Recreational boating can provide vectors (ie., boats and other watercraft) for the spread of aquatic invasive species. Practicing safe and clean boating can help provide prevention, early detection, rapid response measures, and long-term management and control – all of which can help reduce the cost of coping with invasive species in New York State. And for more on aquatic invasive species education, see NYSG's aquatic invasive species Web site (Click Here), and details on the Great Lakes Sea Grant Network's Nab the Aquatic Invader site (Click Here). 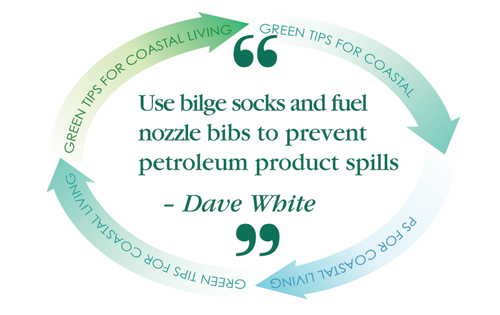 Providing marina owners with practical information techniques, products and practices they can use to improve environmental practices and minimize potential sources of pollution at their facilities. For more on marina environmental Best Management Practices (BMPs) education (Click Here). Rip currents are a potential deadly threat, accounting for more than 80 percent of lifeguard beach rescues. Lifeguards and surfers can usually detect beach rips, but most beachgoers have difficulty spotting them. So remember, When in doubt, don't go out' and swim near a lifeguard. For more on rip currents education, Click Here. Sand dunes and their plants are fine to look at, not to touch. In a single summer, as few as 25 round trips on a path can destroy half the vegetation on the path. While plants living on sand dunes as well as the sand dunes themselves are fragile in many ways, the dune plants are tough enough to survive the harsh conditions of the dune environment if left untouched. In the long-term, you'll be glad you read the signs and stayed away from fenced-in and restricted areas at beaches. Aside from all the animals, birds, and insects that call the dunes home, sand dunes act as a barrier from storm energy, absorbing much of the destructive forces from storms, allowing the inland areas to remain calmer. Minimize your impact at beaches and other public recreational areas by practicing “carry-in, carry-out." Read your local newspapers to learn about upcoming beach cleanups, interpretive hikes, or other stewardship opportunities that you can get involved in. Just to give you an idea of how "pitching in" a little goes a long way: During a 2008 Alliance for the Great Lakes Adopt-a-Beach™ clean-up, 30,053 pounds of trash was removed from Great Lakes beaches across Illinois, Indiana, Michigan, Ohio, and Wisconsin. Reduce the amount of litter you generate and buy goods made from recycled materials. For more on sand dunes and wetlands education, Click Here. And for more on stewardship efforts in NY's Great Lakes, Click Here. The most important rule in developing good fishing ethics is to uphold the conservation laws. Almost every species is governed by a combination of seasonal closure, bag limit and size limit to protect them against overfishing, and these regulations are meaningless without the full co-operation of the public. Abiding by fishing regulations in your area has a greater effect than you may know. Fisheries managers work to balance protection of fish and their habitat while providing enough fish for people to catch. Throughout North America many fisheries are in trouble, mostly from damage or loss of important reproductive habitat that is so necessary to sustain native fish populations for future generations to enjoy. For more on sustainable recreational and commerical fisheries in New York's Great Lakes waters, Click Here. And for more on fisheries in New York's marine waters, including tips on how to be an ethical angler, Click Here. Another way we're helping to bolster public awareness and understanding of New York's aquatic resources is through the I FISH NY program, a partnership with the New York State Department of Environmental Conservation. Throughout New York State, this initiative introduces urban residents to the sport of fishing. And for more on events, lesson plans, games and more provided by the I FISH NY program, Click Here. Why should fishermen take the time to learn about life-survival gear and safety techniques such as fire fighting, the use of flares and how to respond to flooding on their vessels? “Without a doubt, I’d rather learn here on the dock than offshore when it’s 5 degrees in February,” said angler John Scheu, at a Summer 2010 training course in Montauk, NY. For more resources related to safety and survival at sea training, Click Here. Don't flush unwanted or unused medicines. Watch your local news for take-back events. For more on unwanted medicines education, Click Here. When it comes to taking care of your backyard, keep it green through natural means: use non-toxic alternatives to herbicides and pesticides for your lawn and garden. These chemicals can be washed off your property and carried into local waterways. For more on water quality education, Click Here. The more you know about fragile ecosystems like estuaries, the more likely you are to respect their unique character. 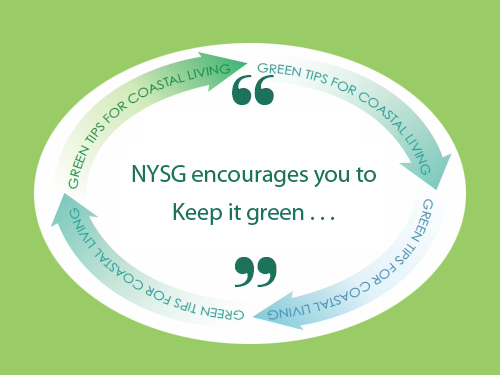 That's why, through a 2009 partnership with the NY-NJ Harbor Estuary Program, NYSG helped update Exploring the Estuary, a guide to estuary education. Estuaries and their surrounding wetlands are bodies of water usually found where rivers meet the sea. They're home to unique plant and animal communities that have adapted to brackish water — a mixture of fresh water draining from the land and salty seawater. If you're looking for another approach to engage young people in environmental education, there 2010's Discover the Hudson River Booklet. Long Island Sound is another estuary of national importance. This natural resource provides recreational fun for us, habitat for wildlife, and income to many local economies. However, the Sound is heavily affected by the 20 million people who live within 50 miles of the coastline. We all must do our part to make sure we understand how our everyday actions affect Long Island Sound and protect it however we can. Conserve water — use low-flow faucets, shower heads, reduced-flow toilet flushing equipment, and water saving appliances. Dispose of cell phones, batteries and other electronic devices properly. Reduce the use of household chemicals by selecting less toxic alternatives and using non-toxic substitutes wherever possible. Conserve energy — one way is by replace your incandescent bulbs with mercury-free, efficient compact fluorescents. For more on estuary education in the Hudson River and NY-NJ Harbor Estuary region, Click Here. For more on estuary education in and around Long Island Sound, Click Here. For additional educational resources, Click Here. Since December 1997, a U.S. Food and Drug Administration regulation has required all seafood processors, including firms that handle, pack, store, or label seafood, to develop and implement a HACCP (Hazard Analysis Critical Control Point) Plan to control all food safety hazards. Through a variety of training courses, New York Sea Grant has helped many of the thousands of seafood processors, wholesalers, packing docks, and shellfish shipppers in New York and across the U.S. that must comply with this regulation. Our Seafood Savvy publication can help consumers better understand seafood products and how to use them safely and confidently. Handling Your Catch: A Guide to Saltwater Anglers offers the basics of good fish handling practices, which, along with a little planning and creativity, should help readers to get much more enjoyment from fishing expeditions - and a great deal more satisfaction from the fish they bring to the table. For more on seafood safety education, Click Here. And to cook up some of our seafood recipes, Click Here.